'Clique' (Keith Keppel, R. 1968). Seedling 64-15G. IB, height 18" (46 cm), Midseason bloom. Color Class-W2V, white ground plicata with narrow stitched edging of violet(M&P 42-H10); white beard tipped yellow. Seedling #61-48B ('Full Circle' x 'Rococo') X Goett seedling #4D-l ('Knotty Pine' x 'Pat's Pal'). Keppel 1969. From AIS Bulletin #193 April 1969 Introducing CLIQUE. Intermediate, 18". (FULL CIRCLE x ROCOCO) X (Goett 4D-1: KNOTTY PINE x PAT'S PAL). The dictionary defines 'clique'as a small select circle. 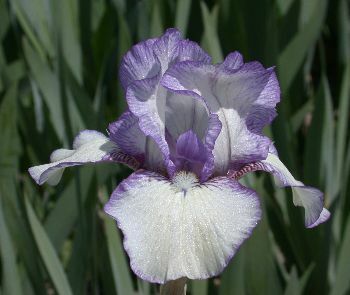 The iris is a dainty white-ground plicata with its circles made of narrow violet-stitched borders. White beard, violet styles, faint greenish-cream veining. Very floriferous. $7.50. Keith Keppel.